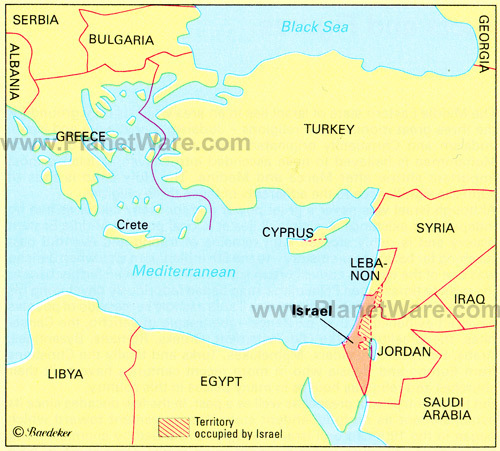 Israel is located in Southwest Asia between the Mediterranean and the deserts of Syria and Arabia. The country borders with the Mediterranean Sea, Egypt, Jordan, Syria and Lebanon (some territories such as the West Bank and the Gaza Strip are still disputed by Israel). Although small in territory, Israel's landscape and climate are varied, and its dense population lives next to a wealth of plants and wildlife, as well as many natural attractions. 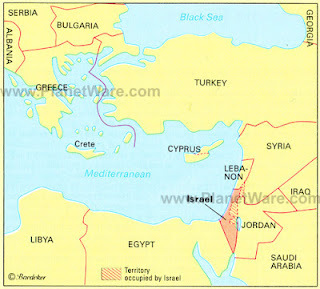 The country is divided into three main regions: the coastal plain, the mountain region, and the Jordan Valley Rift. The State of Israel was created in the Land of Israel which was promised to the People of Israel according to Jewish tradition. The meeting place of three continents and two seas, the country is a skein of cultures, customs and traditions, a country that was home to many people, cultures and changing religions. Most air pollution is created by transportation, energy production and industry, and these have all increased dramatically over the last few years. The major air pollutants are particulate matter, nitrous oxides, ozone, hydrocarbons, carbon monoxide, sulfur dioxide, carbon dioxide and lead. Air pollution in Israel is aggravated by its own landscape. The small land area, arid climate, lack of rain, and coastal industries near densely populated communities create an increasingly poor air quality. 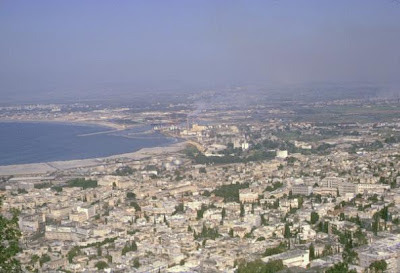 The Haifa Bay is one of the most affected areas. Stringent emission permits have improved the situation significantly. In Jerusalem, it is not industrial but vehicular pollution that is responsible for the degradation of air quality. Rapid population growth brought hundreds of thousands of new residents to the city and so the infrastructure has multiplied accordingly. Nothing has been done to lighten this polluting factor. Succeeding Israeli governments have always favoured private vehicles over an efficient public transport system, some say because of the enormous taxes and fees private vehicle owners pay. As a result the city suffers, not only from its own congested vehicular traffic, but from the clouds of vehicle-generated pollution that drift up from Tel Aviv and the entire, highly-populated surrounding region. Water is Israel's most pressing environmental challenge, and is indeed the area where Israel has made the most progress. Several years of insufficient rainfall and increased demands due to population growth and expanding industry have lead to a major drain on the sparse water resources which already exist. Many of Israel's rivers have either dried up or become contaminated by industrial discharge, sewage and agricultural pollutants like pesticides and fertilizer. Israel's only fresh water lake consistently sinks below the minimum level that it needs to maintain its integrity without turning into a swamp; even the Dead Sea is reaching record lows and is at risk to dry up completely. Most drinking water comes from coastal and mountain aquifers which are quickly being drained or polluted. The quality of drinking water and sometimes the strong taste of chlorine in most of Israel's water, is unsatisfactory and is expected to continue declining. In the last 20 years great strides have been made in the prevention of pollution from oil spills. In consequence, tar on the beaches has been reduced by more than 200 percent. But other pollutants are still being dumped into the sea including sewage and polluted water from chemical plants, and in some cases, permitted dumping of chemical waste at sea. Much still needs to be done since in several harbours mercury and other toxic metal contaminants have rendered the fish unsuitable for food. Most of the systems used in Israel for the discharge of sewage effluents are inadequate to the demands placed on them today. Many are old and need repair and even more were never designed to cope with a population that is increasing at such a rate. In most places there are no treatment facilities beyond sedimentation and aeration and in some the raw sewage simply flows into the wadis. Rather more than 95% of Israel's solid waste is buried in landfills, burned in open-air pits or left to rot in garbage dumps throughout the country. Recycling in Israel is so minimal as to hardly deserve mention. The ministry claims that "recycling has not yet been proven to be effective or economically sound." By artificially keeping haulage rates low through subsidies, the ministry has created a situation in which Israeli towns and cities pay approximately one tenth of what is paid in other industrialized countries, making it simply not worthwhile to change the system. Toxic waste disposal in Israel has significantly improved over the past few years but is still a long way from satisfactory. Twenty-five years worth of back-logged materials are kept in often leaking containers and the poisonous materials that seep into the soil are a threat to the Negev aquifer and a potential health hazard to communities kilometres away. An incinerator capable of handling toxic waste has been installed but the facility's capacity must be enlarged. Since Israel exports a variety of fruits, vegetables and cheeses, attempts are indeed made to keep pesticide levels to a minimum, since the growers and producers know that food exceeding the stringent European standards will be returned. However, whenever foodstuffs are returned for this reason they are usually diverted to the Israeli market because of the less stringent standards and because there is no adequate monitoring system in effect. Private studies, some of them carried out by the ministry of the environment and some by NGOs, have shown that about 12 percent of the vegetables and fruits that reach the market exceed even the liberal Israeli standards for pesticide residue. Reforestation efforts, have helped to conserve the country's water resources and prevent soil erosion. Israel has reclaimed much of the Negev for agricultural purposes by means of large irrigation projects, thereby stopping the desertification process that had been depleting the land for nearly 2,000 years. Because of stringent hunting laws and very active protection of wildlife, Israel has become a refuge for many native animals in an area where there is little protection offered. Israel is the temporary abode and therefore de facto guardian of more than three-quarters of Europe's migratory birds, which stop over here on their way south in the autumn and on their return to Europe in the spring. However, in 2001, 13 mammal species and 8 bird species were endangered. Nineteen species of plants were threatened with extinction. Endangered species included the northern bald ibis, South Arabian leopard, Saudi Arabian dorcas gazelle, and three species of sea turtles. A significant development of organizations for social change in general, and of the environmental movement in particular has been seen in Israel. Whereas, in the early 1990s, the number of Israeli environmental organizations could be counted on one hand, currently over one hundred NGOs are active in Israel either on a national or a local level. Environmental education and development of environmental leadership are emerging interests. This significant development can be attributed both to the rapid rise in population and the development of Israeli civil society. In contrast to the democratic development and vibrant dynamism among social and environmental NGOs, it seems that the Israeli government does not view these organizations as allies for sustainable development. Contrary to its commitments in Agenda 21, the government does not encourage or coordinate dialogue between NGOs and government authorities in order to make intelligent use of the former's knowledge and capabilities. Moreover, the government has been accused of creating obstacles to transparency of information, and the limitations of the existing planning process impede access to justice. Also, various Israeli governments have enacted legislation which reduces the ability of the public and of civil organizations to exercise influence and to be a part of policy-making. Again, these actions are in flagrant contradiction of the Israeli Government's commitment to promoting legislation to assist NGOs participation in these processes. However, due to a series of actions taken by NGOs lately, various government ministries (mainly in the planning field) are beginning to seek mechanisms and procedures for NGO and public participation. introduce the Green label - that is given to a product defined as less harmful for the environment. The Bank of Israel notes that Israel has been levying a range of environmentally related taxes while cutting direct taxes. A 2008 comparison with OECD countries found that revenues from environmental taxes accounted as a proportion of GDP in Israel above the OECD average, mainly due to Israel's high fuel excise and taxes on vehicles. Furthermore, Israel's public transportation is inadequate, forcing people to use private cars. The Bank advises extending taxes that are not derived from fuel consumption and vehicles, in order to create incentives to use advanced methods for waste disposal and reducing pollution. The Green Taxation on motor vehicles, which came into effect in August 2009, differentiates the purchase tax on the basis of a vehicle's emissions. For the first time, tax rates on vehicles was linked to the level of pollution emitted by these vehicles. Relatively clean vehicles will enjoy a significant tax benefit and lower sales prices while polluting vehicles will cost more in the wake of the reform. The Bank of Israel says that tax reduced air pollution without changing the tax burden by reducing purchases of high-emission vehicles in favour of low-emission vehicles. As for other environmental taxes, Israel, like other countries, is in various stages of implementing reforms to increase these taxes and they are expected to account for a larger proportion of tax revenues in the future. Reforms include higher taxes on sewage, waste disposal and the restoration of abandoned quarries, as well as the introduction of congestion taxes and taxation of emissions of pollutants. The tax on landfill for household waste is the most significant. The price of landfill in Israel has been very low until now relative to the developed countries and as a result there has been little incentive to shift to more advanced methods of waste disposal. In December 2010, the government decided to gradually raise the landfill tax for mixed household waste and two other laws regarding packaging waste and tyres impose the responsibility for recycling products on the manufacturers. In Israel CSR is still in its infancy. However, while Israeli companies were late to adopt CSR compared with businesses in industrialized nations, they are catching up now with intensive CSR activity. Over the past decade, Israel's business community has focused its attention on social and community-based issues such as youth, education and health and welfare issues, as well as environmental issues such as waste, water resources and air quality, with the banking and communications sectors leading the way on CSR reporting. More recently, as significant progress has been made on these fronts, emphasis has shifted to issues such as diversity in the workplace, equal opportunity for employment and protecting the rights of workers, including contract workers. The slightly late entry of Israeli companies into the CSR arena is due to several reasons, mainly the comparatively small size and reach of Israeli companies. Israeli companies, as relatively small players in the global market, have less need to lead in CSR, considering the resources investment required to attain this kind of positioning. On the other hand, since the Israeli market is small and limited in size, many Israeli companies are looking to expand overseas. To become legitimate global players, they must play by the accepted rules of the game. In a world in which everyone does business with everyone, Israeli companies will be expected to comply with CSR principles. For this reason, CSR is now penetrating the Israeli market at an accelerated pace, with companies seeking to close the gap, especially versus other businesses in Western countries.